Testimonials | Home Renovation, Remodeling Honolulu Hawaii | Bath & Kitchen Remodeling in Hawaii | Paragon Builders, LLC. Chris Koike, owner of Paragon Builders has worked on 6 residential projects at my residence and 1 commercial project for Rehabilitation Hospital of the Pacific where I was employed. 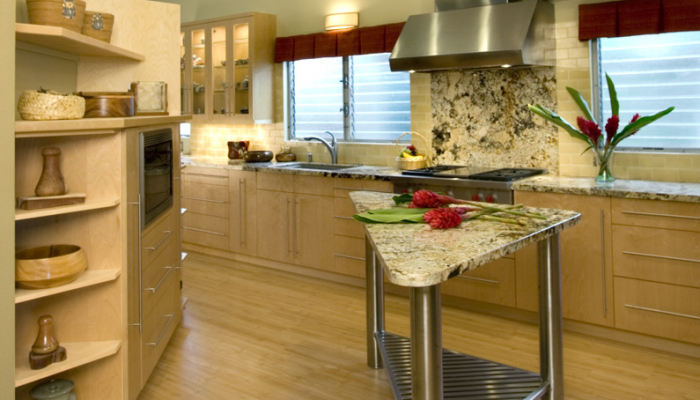 Projects ranged from kitchen, bathroom, extension and commercial kitchen work. In all projects he has shown his professionalism, expertise and dedication to “doing the job right”. Customer service is excellent as he maintains daily communications, thus allowing opportunity for dialogue. Paragon Builders’ work is of excellent quality. Dust and dirt is contained as much as possible. At the end of the day, the work area is swept and neat. I would not hesitate to call Chris for any future projects as I trust his company’s workmanship and customer service. This is supported by the fact that he has already performed 7 projects for me already! I would highly recommend Paragon Builders for anyone looking for the services of a general contractor. Chris Koike and Paragon Builders completed gutting and full renovation for a bath and kitchen for us in November 2007. It would be helpful to note that I am a bit of a picky person. This not only is for the finished product, but also for the way a person/company work with me and my requests. In all phases of this project, from inception to completion, Chris was there to completely satisfy everything that needed to be done. It is a fact of life that projects of this sort always have things that need to be changed once the project gets under way. New decisions need to be made. At times, we would need to bounce things around. Chris always completed my ideas and made them better. He and his subs worked very well together in completing work that both my wife and I are very happy with every day. I expected great things with Chris, and he delivered flawlessly. He takes pride in each facet of his work. That and his attention to detail are very, very hard to find. In fact, I would go so far as to say that if you need to re-arrange your project start date in order to get him, it will be worth it. I would not hesitate to have Chris do another project for me. If you would like to speak with me personally, please feel free to ask Chris. My Wife Yumi and I want to express our sincere appreciation for Paragon’s outstanding work on the extensive remodeling project for our condominium unit at Dowsett Pt. As so nicely presented in the “after” photos posted on your website, the final product is a work of art. 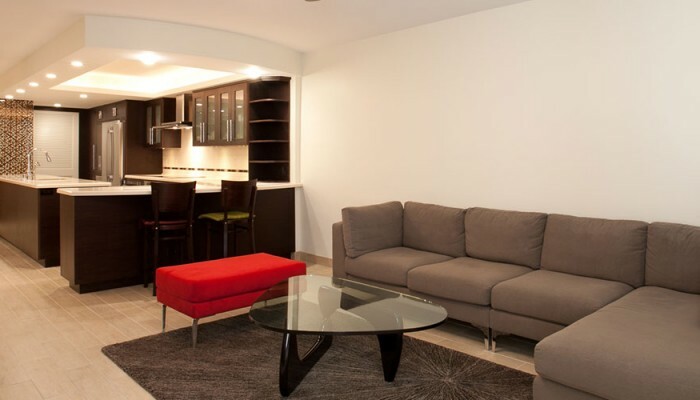 We are truly amazed by the high quality of workmanship throughout the unit. At all times during the remodeling effort, you and your crew displayed the highest level of professionalism. Your crew of Stan, Oscar and Donn are to be commended for their tireless commitment to excellence. We were continually impressed by their focus and attention to every level of detail and the resulting perfection displayed in the final product. Yumi and I will always be gratefull to you for making our dream home come true! I am very happy with the work you have performed when renovating my home. You are very efficient, patient, caring but most of all compassionate in the changes, which I have made during the process. In addition, during the [mal inspection, you made sure that all the discrepancies were taken care of to its perfection. In October 2007, I hired Archipelago Hawaii to do my renovations and as a result, they introduced me to you and another gentleman to bid for the job. The bid came were almost competent in price but I truly felt that you had better qualities than the other person and would listen to my needs and goals. During the process, you always communicated and coordinated with Archipelago Hawaii and their staff to make sure that the materials, contractors, subcontractors, architects, interior designer and all members on the team were working toward completing the job in a timely manner. Since all the cabinets, appliances, doors were custom; we had to wait for it to come in. Delays existed but you managed to protect my home from any damage. I clearly remember that we were extending the back lanai to make it into my office and we had the 40-day rain and you couldn’t complete the roof because it was too wet to place the proper roofing on it but you concealed the areas. You are very creative in your abilities in solving unexpected problems as they arise. In summary, I would recommend you to anyone who is interested in getting the job done in a timely manner and reaching the final inspection with happiness and satisfaction. If anyone is interested in calling me for more details please have them call me on my cellular phone at 371-5409. Thank you for being so wonderful and awesome to work with. We truly appreciate and love our updated bathroom and new toilet! We look forward to doing more when we have the funds to do so. Our dream is to upgrade from the condo someday. After years of dreaming of this renovation, many months of trying to find a company that could fulfill this dream, and many more months of planning my kitchen and bathroom layout, my renovation is FINALLY DONE AND I COULDN’T BE HAPPIER AND MORE SATISFIED!!! Chris Koike and his dedicated and hardworking crew, Stan, Don and Oscar worked hard and efficiently to satisfy every concern and every request throughout the entire process. Whenever I had a question or concern, Chris was always very quick to address it and to problem solve. He was never satisfied until things were exactly to his high standard, and of course, to MYsatisfaction as well. Small things about Chris and his workers also make a huge impact on my satisfaction …such as how considerate they were about noise level, cleaning up each day after they were done working, and their willingness to listen to my concerns each day. They were certainly a pleasure to work with! As a result, the final result is STUNNING and AMAZING,one that makes me so proud to wake up to every morning and come home to everyday after work! THANK YOU CHRIS! I look forward to the next phase! Chris Koike, the owner of Paragon Builders truly strives to achieve perfection. His men also share in Chris’ vision to deliver perfection. 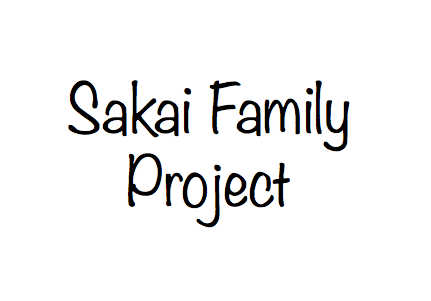 Our project was a renovation and as such we stayed in our home for the duration as they worked around us. We were always kept abreast of what was going to be done each day, usually the night before. We so appreciated the fact that the Paragon men always, always, cleaned up before they departed for the day. Chris has a very critical eye and he would spot things that were not done, or not done perfectly, and he would have it corrected immediately. Chris was always on top of everything that was going on. He would call us daily, and made it out to the job site very often. I will not pretend that it was smooth sailing all the way – if only! However Chris was there to make sure that the problems were met head on and corrected to our satisfaction as well as to his. With head down, I admit that I did not want to hire Chris at first. He looks so young and I personally felt that a young person would not be up to the challenges that might present itself. There was a discussion with family members and we decided that Paragon Builders would be the company we selected. We are not disappointed. When we decided to remodel our little garage studio we didn’t even bother asking for other bids, we just called Chris. We enjoyed working with him and listening to his suggestions which were always useful and practical. Sometimes he’d advise against cutting short on quality when we were thinking quantity by reminding us of what we wanted to achieve. Usually we’d defer to his advise and after the job was completed we were glad to have spent a little more for a better finish. After the studio came work on installing a double decks on a house we own in Aiea. After telling him what we were thinking, he had a draft of our ideas drawn up to visualize the concepts. After changes and modifications to enhance the design, he started work. His solid foundation and over structured framing insured that the decks could withstand the stresses of loads and vibrations as well as the effects of long term weathering. One significant choice was the use of composite materials which protects the decks from sunlight and water damage and would increase longevity. Living in Hawaii, one mustalways be aware of the elements which start to destruct whatever you construct. Since then, Chris’ company, Paragon Builders, has completed more remodeling of our home, remodeled our father’s home and a 2 bedroom rental. He has been our choice for value, because he will complete each job with professional results for a price that isn’t over inflated. Brian and I remodeled our home in 2009. 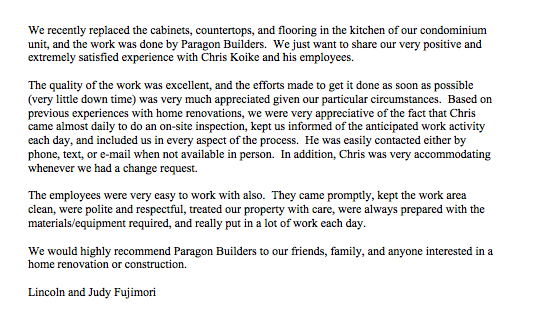 We chose Paragon Builders because of the affordability and the instant rapport with Chris Koike. 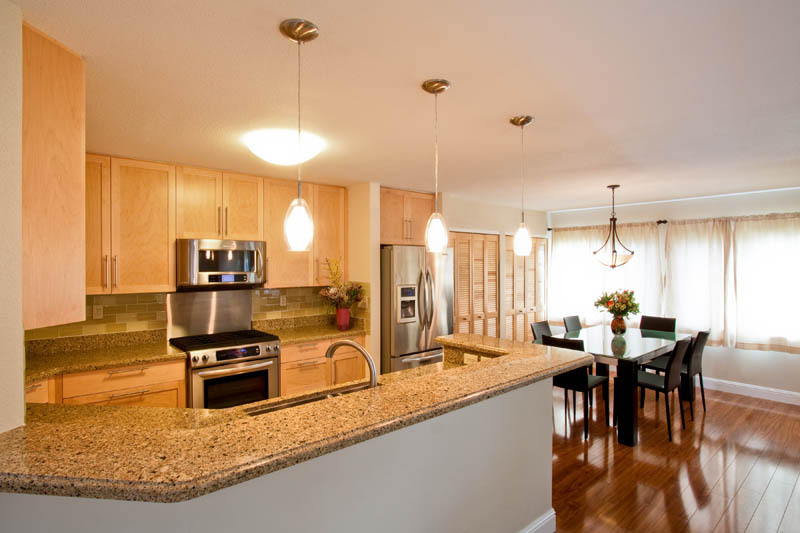 We have no experience in renovations or construction but he relieved our anxieties with his knowledge ability in this business, explaining every step. We always had many questions though the whole process and Chris was very patient and understanding, he always made sure we got our answers even after work hours. He also brought his ideas and vision from his experience, making suggestions as if it were his own home he was renovating. He always told us many times, if you are not satisfied then he would not be satisfied. Chris is a perfectionist and has high expectations of his workers. Chris came to the house daily to check on the work and made sure they represented Paragon in their work. The crew did show their commitment to their work. His workers were very respectful with us and our neighbors. We had many compliments from our neighbors about them. This was very important because we live in an association with strict rules. We made changes in plans because some of the details were not incorporated that should’ve been there so it took extra planning, experience and creativity in a few areas like the kitchen and the structure. This gave us the extra storage pantry in our kitchen, and the secure beam for the structure. The end product has made our home into something more spectacular than what we could have dreamed of. We’ve had many compliments on our new home. We highly recommend Paragon Builders, LLC to all of our family, friends and to you for quality work that you can depend on. 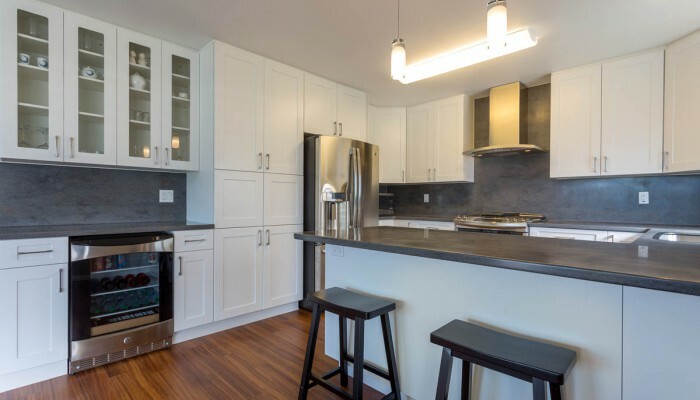 We recently replaced the cabinets, countertops, and flooring in the kitchen of our condominium unit, and the work was done by Paragon Builders. 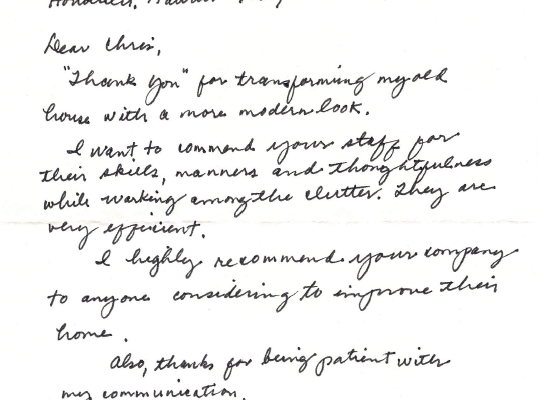 We just want to share our very positive and extremely satisfied experience with Chris Koike and his employees. The quality of the work was excellent, and the efforts made to get it done as soon as possible (very little down time) was very much appreciated given our particular circumstances. Based on previous experiences with home renovations, we were very appreciative of the fact that Chris came almost daily to do an on-site inspection, kept us informed of the anticipated work activity each day, and included us in every aspect of the process. He was easily contacted either by phone, text, or e-mail when not available in person. 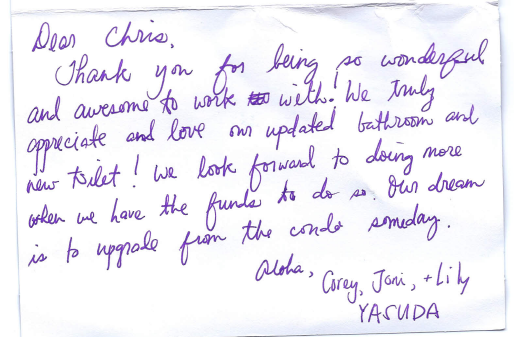 In addition, Chris was very accommodating whenever we had a change request. The employees were very easy to work with also. They came promptly, kept the work area clean, were polite and respectful, treated our property with care, were always prepared with the materials/equipment required, and really put in a lot of work each day. We would highly recommend Paragon Builders to our friends, family, and anyone interested in a home renovation or construction. Our holiday season has just come to a close and it was a fabulous one due to our expanded living space thanks to you and your crew’s diligent, meticulous and eye-for-perfection work habits and final products. We just can’t believe the 7 months of construction and renovation, while we lived continuously in our home, are over now and our beautiful new second floor addition and all the repairs for our 50+ year-old living space are now completed (such a relief!) As we enter our retirement years, Steve and I are delighted to be able to have our son and his wife come to live with us and to be able to have our entire extended families (60-75 people) attend holiday events here without any concern for additional party space. We have had continuous compliments from neighbors walking by as well as our families and guests about the quality of construction and the beautiful house we now have. Our two children who returned for the holidays could not believe the ‘castle’ we built for them! Although the normal dust and noise of any construction site was part of our lives for these months, your subcontractors and your crew made the whole experience a fun and learning one for us because they were willing to be understanding and accommodating of the many rainy days of Manoa and the continuous problem with water in the ditches, etc. They were diligent about cleaning up before leaving every day and always listened carefully to our input on every phase of the project. Your scheduling of all the contractors along with our personal schedules was masterful and always with a lot of aloha for us. Your advice, guidance and ability to give us more than one solution to any problem/situation was invaluable and much appreciated! So as 2016 starts, our family cannot express how grateful we are to you, your crew, your subcontractors and all of the business elements involved in our project. WE LOVE, LOVE, LOVE OUR HOUSE NOW!